Did you, your relatives or anyone else you may know ever suffer from an insult, verbal abuse or aggressive behavior or physical threat because you look different, you speak a different language or you wear clothes reflecting your faith; and decided not to report the incident to the police, because it is cumbersome, or the police won’t believe me or they would not be bothered to make any progress with the case or anything else; please rethink now, because reporting such a case has come to your doorstep. 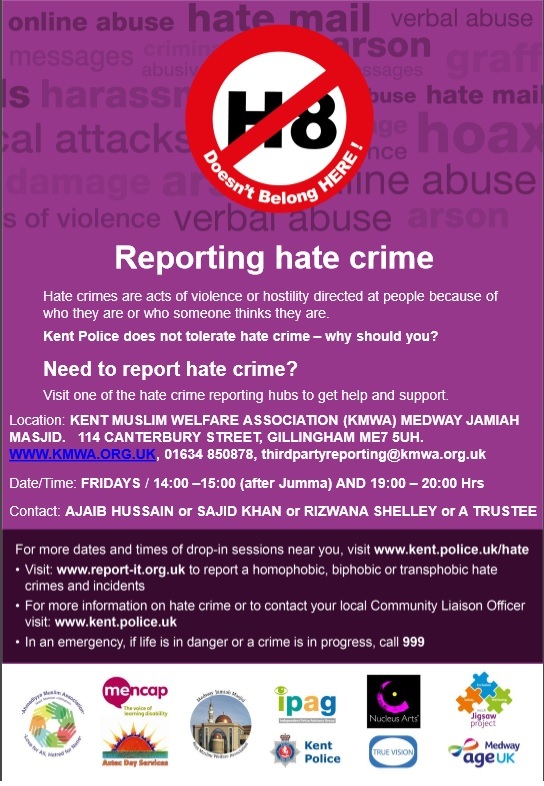 The Kent Police have started a new scheme of reporting through ‘Hate Crime Third Party Reporting Hubs’. We are pleased to announce that KMWA is participating as one of those community hubs as an additional service to support our community. We will facilitate the reporting of hate incidents to help prevent further incidents in a confidential, friendly environment suitablefor all ages, male or females, with complete data protection. An on-line form will be completed together with the victim in a confidential room and submitted to the authorities directly from a secure and confidential web page. By reporting such incidents, trouble spots can be identified, and the perpetrators brought to justice. Hence, it is vitally important that we report the issues and challenges we are facing as a community; regardless of whether it is Islamophobia, intolerance, bigotry or racism in nature. by telephone (01634 850878) or email ( thirdpartyreporting@kmwa.org.uk) and will be available for discussion on Fridays after Jummah and Issha/Maghrib prayers at the mosque. If for some reason they cannot be reached, one of the other trustees can be contacted and they will follow-up accordingly. Further details and updates will be available on theKMWA webpage: http://kmwa.org.uk. either victims or the police. The aim is to provide a facility and service to help report hate incidents or hate crime without victims having to talk to the Police, in a safe environment. We simply facilitate the reporting process, offer support and advice, provide any further information needed and give the vulnerable victims a voice. We would like to emphasis again that all statements will be treated with the strictest confidentiality and what constitutes a hate crime is anything that is perceived as hate crime. about it to make this service a great success.